Lately, I’ve been a little obsessed with bubble baths. This got started when some of my longer walks left me feeling gimpy. I’d pour a bunch of Epsom salt into a tub full of steaming hot water, soak, and later joke about needing to take an old-lady bath in order to be able to move. It was just a joke, though, because old-lady Epsom salts and achy body aside, the bath always feels like a victory lap to me. Why? It’s simple: I fit in the tub. It used to be, my body completely filled the tub from side-to-side; I created a damn around which no water could flow. I could take a bath and end up with my back being totally dry. Also, it was very difficult for me to get up out of the tub. It’s still difficult to do that, but only because I never want to get out of the tub. I did get a little tired of watching my extra flappy skin/loose fat float around in the water, though. So, in addition to Epsom salt, I now make sure I have ooodles and oooodles of bubbles. Bubbles are fun. Bubbles are happy. You can sculpt things in bubbles. You can blow them around. Every life should have more bubbles in it. The most recent theories on good muscle recovery include avoiding heat and icing ones muscles instead. 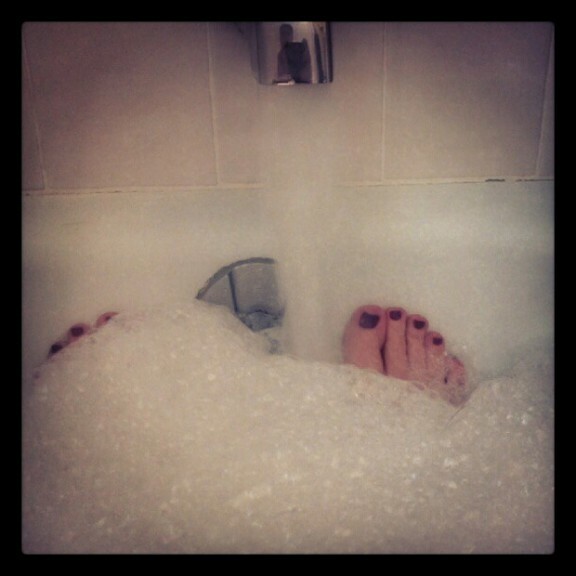 To that, I say: “ppppfffft!” I’ll continue with my bubble bath victory laps, thank you very much. This entry was posted in Fighting the Limp and tagged in walk, weight loss.